attributes defined in other scripts. 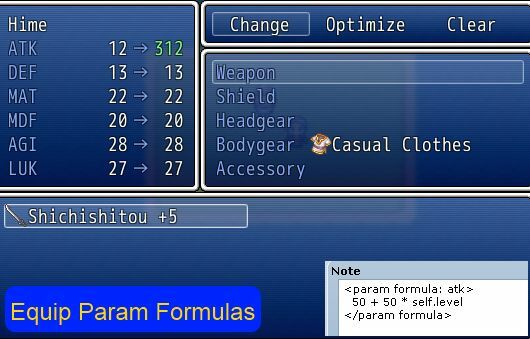 define a formula that uses the level to determine the weapon’s parameters. I can&apos;t decide between having basic weapons multiply ATK by 61% percent then weaker or stronger ones have a higher or lower multiplier, or to simply have it so that it is an additive value to where at any given point, an average weapon&apos;s ATK value will generally be about 60% of the main character&apos;s assumed level in that point in the game. I&apos;d probably introduce an upgrade system where old weapons are required to create new ones. for some reason, using this script, the fps drops a bit during the battle. Does it drop a lot when you try it in a new project? How many equips are all of your actors wearing? there was a decrease of 8 fps. It is a considerable value (mainly because I&apos;m using a system of lateral battle, and it consumes processing – Battle Symphony) . Was with 3 heroes, each hero had one equipment. Unless the problem is my computer. Hi, Hime. This script sounds really great, thank you. I&apos;m wondering if it would be possible to use the parameters of the equiped actor in the parameter formula. For example, for a weapon that would increase the attack of the equipded actor depending on the actor luck. That was my original plan but some compatibility issues came up with the default scripts and I had to stick with just the equip attributes themselves.